SEGA of America has released a series of short live action films for Yakuza 6: The Song of Life on the SEGA America YouTube channel. These short films, produced in collaboration with Liquid Advertising and director Christopher Ewing, were all shot on location in Tokyo, Japan. They focus on exploring the legend of the Dragon of Dojima from the perspectives of three individuals who had their lives changed and their own dragons awakened due to Kiryu's timely intervention, and his uncompromising moral strength. 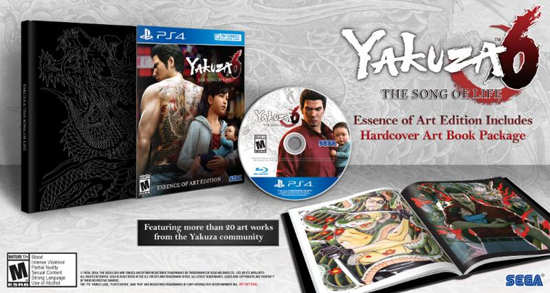 Each installment in the series is inspired by a Substory that occurs in the Yakuza series, including "The Bouncer" and "Prodigal Son" from Yakuza Kiwami, and "Another Haruka" from Yakuza 5. Characters are revisited several years after their fateful first meeting with Kiryu, and we see how their lives have changed since then. Whether you're a longtime fan of the series, or just being introduced Kiryu's legends for the first time, you'll have a newfound respect for the Dragon of Dojima after experiencing these stories. Experience the finale of Kiryu's saga firsthand when Yakuza 6: The Song of Life launches in the West on April 17! The "Essence of Art" edition is almost sold out! You can pre-order the launch edition of the game today which contains a sleek hardcover art book that also doubles as the disc holder!